Small towns in Oregon pack a mean punch when it comes to eating and drinking. And as Oregon’s flagship port town, Hood River is no different. Stationed along the Columbia River Gorge with first-class, window views of most every statewide natural wonder, Hood River is well-positioned in wine country, right on the water, amidst sprawling farmland. HR is well known for its world-class grub, beer, cider, and wine -- and it flaunts it. It hosts a cider festival every April and a beer festival every September, with over 440 local orchardists and 50+ beer vendors, respectively. But you should give your liver a run for its money by pinning it against your stomach, and exploring these culinary cornerstones. 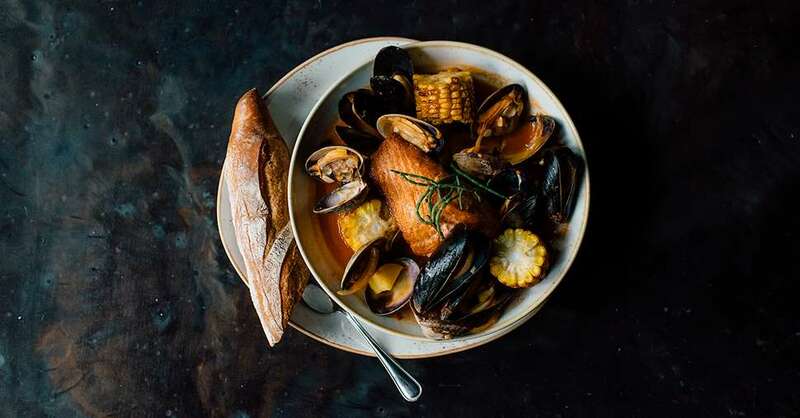 If you want a real taste of the Oregon countryside, Celilo crafts a chameleon of a menu that mixes and matches the best and brightest of Oregon’s seasonal bounty. This is where you’re going to find the most desired, locally-sourced steak, salmon, wine, and fruits. That means you can drink, eat, and dessert all like a local. Why have eggs and bacon when you can have Norwegian eggs and bacon. Imagine if IKEA had excellent food, a suave interior, and a line that didn’t resemble something out of a cafeteria -- that's Broder Øst. It's a Scandinavian-style brunch spot birthed in PDX, and the lines are the stuff Portlandia skits are made of. It recently opened a new location in Hood River, and its sparkling reputation precedes its signature pancake balls. But don't stop there. All the menu items are made using seasonal ingredients and the eggs are some of the best you'll find in Hood River. If you don’t own a Subaru, there’s only one other way to authentically view Oregon and its many splendors: by bike. 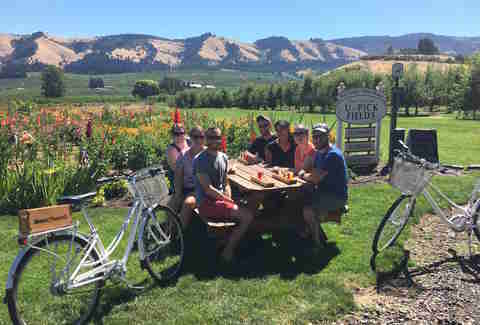 MountNBarrel’s wine tour takes the thirsty traveler to a number of local wineries by mixing and matching private vineyard tours, complimentary tastings with light farm-to-table lunches, and heightened views of Mount Hood and Mount Baker. You can also customize stops, so make sure to do your homework ahead of time. Widely considered to possess the best Mexican in the gorge, you’ve gotta make a pitstop at Taqueria El Cuate. 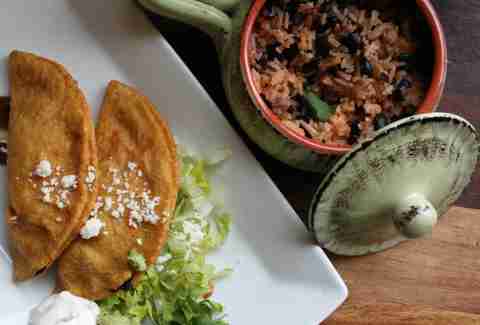 Handmade tortillas mean original, hearty tacos with generous servings of meat. This is Hood River’s most resonating response to the drunchies. Sidenote: they even make a superb hamburger for $7, which is cheaper than what you will find at any of the local breweries. 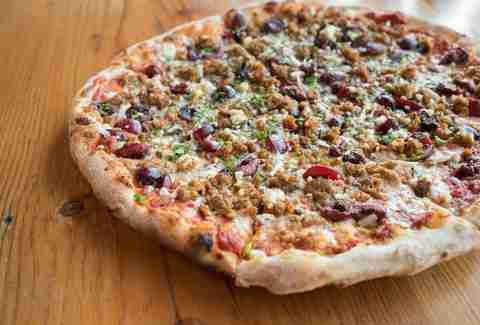 This waterfront, wood-fired pizza joint has been a fan favorite for some time. Originally from Washington, a Kickstarter campaign helped fund Solstice at its current location in Hood River. This is where you go if you want gluten-free pizza that'll have you mouthing "this is gluten-free?!" whilst scarfing down pies with seasonal toppings and enjoying views of the river. For an interesting but incredibly delicious pie, opt for the award-winning Country Girl Cherry, which yes, includes cherries. But seriously, don't knock it 'til you try it. Don’t let its facade fool you. Twin Peak’s resembles the log cabin Abraham Lincoln came from, but is anything but kitschy. Oddly, for a place known for sundaes, curly fries, tots, it also has a remarkable veggie burger for $6 -- and an actual beef burger for an alarming $3.50. It can get a little busy and cramped inside, but if it's nice out, head outdoors to the picnic tables and soak up the beautiful weather. 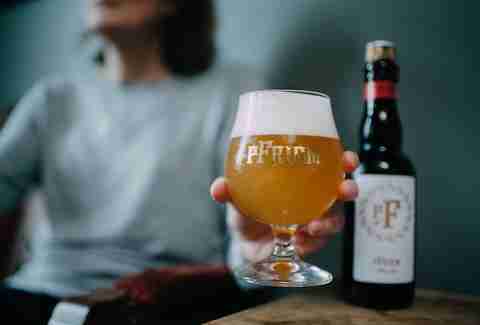 There are many beers to try in Hood River, but pFriem takes the cake for Belgian ales. To wit, pFriem has won the following accolades since launching in the summer of 2012: Brewery of the Year, Best of Craft Beer, and Best BrewPub Experience. Pro tips: buy their turkey sandwich (it pairs great with a beer) and take a stroll through HR’s Waterfront Park, which is just across the street from the tasting room. Other town coffee shops -- like Dog River Coffee -- tend to sell Stumptown (which is a great drip! ), but Stoked supplies its own six blends and dubs itself “the official coffee of the outdoors.” This might be due to its partnership with a collective of triathletes and cyclists, who make up Team Stoked. And if triathletes and cyclists trust the coffee, it's gotta be pretty tasty. Romul’s might be Hood River’s hidden gem of local seafood purveyors. Other pasta stalwarts, like Celilo, will undoubtedly have a line, so check Romul’s. The quality is top-notch, the prices are slightly cheaper, and the staff is said to be friendlier. As for the pinnacle dish? Romul’s clams steal the spotlight: steamed, silky and fulfilling, all for under $17. And you know that any restaurant that has penne à la vodka as a regular menu item cares about your general well-being and full stomach. You won’t go to Boda’s to wine and dine, but it's absolutely where you should go to snack. It’s Hood River’s premier delicatessen, and it also serves as a souvenir shop for rare oils, sauces, and picnic snacks from a wide array of international destinations. It also gets plenty experimental when it comes to its gourmet, locally sourced menu that changes daily based on what's fresh (read: chicken curry potpies, banh mi, tuna melts, etc). Big Horse is Hood River’s first brewpub, which might be why the owners managed to scoop up such prime real estate, with stunning views of downtown Hood River. The place looks like it belongs in the Swiss Alps, which adds to the ambiance and complements the menu of Oregon mussels, truffle-parmesan fries, a black & blue ahi burger, and a crazy good mac & four cheese. Just because you’re drinking beer doesn’t mean you have to stick to sandwiches and burgers. If you’re looking for some premium Asian cuisine, locals love the ever-accommodating Pho River, which has the vegan customer on the brain. If you're not vegan, no worries, they also offer a menu that will satisfy most Thai culinary desires (pad thai, etc.) making this place a two-in-one if you and your drinking buddy hold mismatched cravings. Two words: white whiskey. If you thought whiskey always had to be brown, this distillery is working hard to prove you wrong. 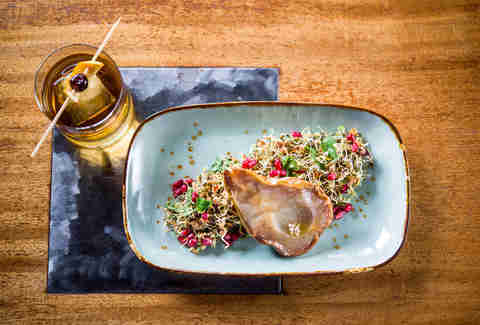 The team at 1805, like other liquor sources and grub spots around town, tends to utilize local berries when and where it can, meaning the whiskey comes out a bit more different than you might expect. Get a flight of spirits and make it a party or opt for a White Manhattan (white whiskey, vermouth, orange bitters, demerara) or a 100 Lashes (white whiskey, Lillet, Bénédictine, orange bitters, demerara). 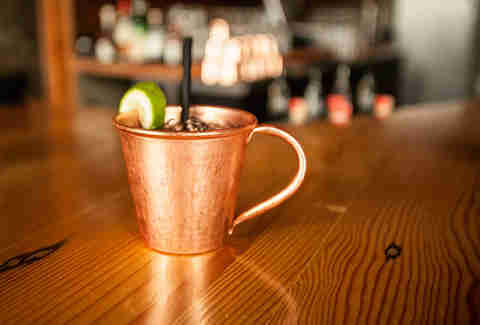 Sporting a name synonymous to "family," Kin is Hood River’s answer to those who are not looking for a quick fix meal. However, this is one hell of a place to wine and dine before and after the bill comes (which is a little pricey, but definitely cheaper than city prices). If you’re a vegetarian, you’ve gotta try the mushroom toast; you won’t find anything like this in Portland. If you’re not a vegetarian, look out for the whole branzino, duck confit, or the rib-eye with creamed spinach. Jack Rushall is a Seattle-based freelance writer for Thrillist, MUNCHIES and The Washington Post. He likes to open windows. You can follow him on Instagram @fromrushallwlove, or on Twitter @JackRushall.